This week for reading, we've been learning about the women's suffrage movement. Our must do was to complete two activities that showed a resemblance to the suffrage movement, but we were to only blog one. My two activities I did with Alex, and we're proud of what we've completed. Our work that you can see below was about making a connection with words. We had to define four words, (Suffrage, Vote, Change, and Radical) and use a mixture of shapes to make an image of what that word can define by images. 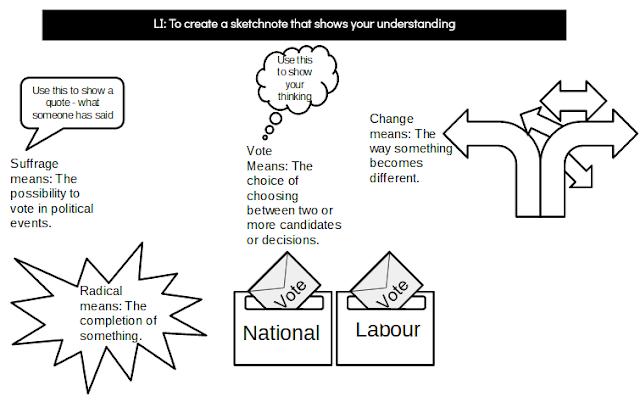 Although me and Alex went one step further, we used a few more shapes and text to make the sketchnote more interesting.